This could be a very short blog. Skiing anywhere in the Adirondacks is great right now. Whiteface is buzzing with almost four feet of new snow. The Olympic cross-country trails at Mount Van Hoevenberg are in epic condition with similar amounts. The Jackrabbit Trail in my neighborhood; from Route 73, or Cascade Road in Lake Placid, up and over the mountain to Keene is probably in great shape, and is on this afternoon's reconnaissance mission. Speaking of missions, yesterday afternoon's ski was a beautiful tour at MVH; I missed the wax so had no kick, but it was very warm; 35 degrees and snowing, and great to be out. My neighborhood lucked out and did not receive any rain so far through the course of this weird storm. Nor did the big winds hit. That was a big relief to me since the favorite car is still in the shop from the last big storm. The clean up effort from this storm continues. It snowed off and on all day and all last night, and continues to snow lightly as I write. 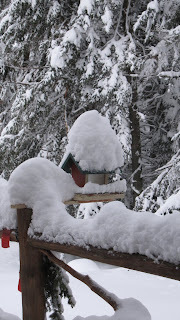 As you can see in today's photo, the bird feeder is low on the shoveling priority list. I hope all my skiing and outdoor enthusiast friends and readers are enjoying these conditions. This is what we train for!